With Sergio Aguero returning for gameweek 6 I suppose it’s time to recommend that you make room for him in your team. At this point, if you weren’t already preparing for this, it’s going to be a difficult proposition, especially considering his price at 13.0. Prior to week 4 I broke down and used my wild card. 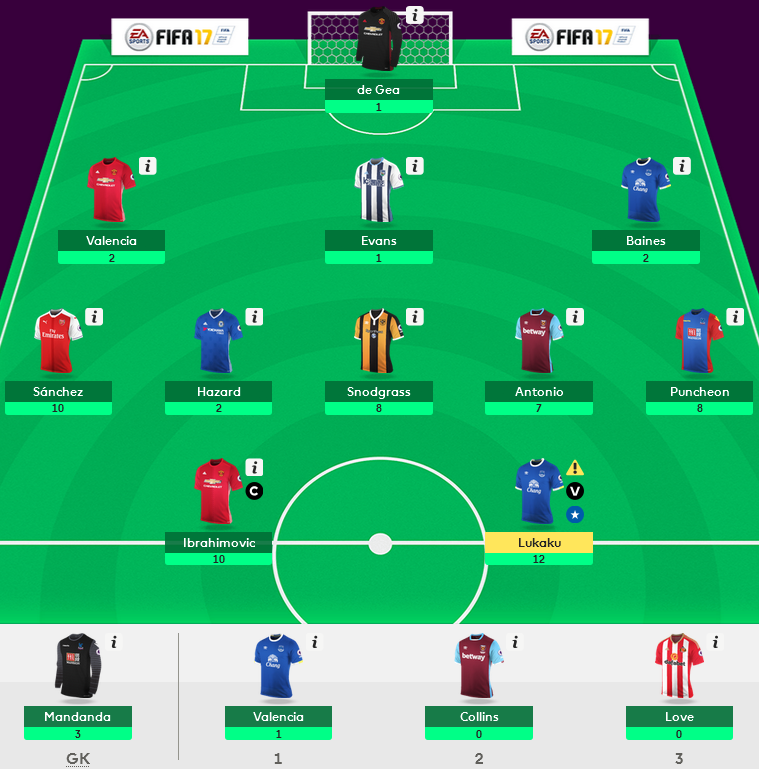 This is not something that I typically do, but my team was a mess and my gamble on Henrikh Mkhitaryn did not pay off at all and Gylfi Sigurdsson was not producing. I went from a week 3 score of 42 points to picking up 61 and 63 points in weeks 4 and 5. For my wild card I made several radical changes including dropping Sergio Aguero and bringing in several bit name players including Alexis Sanchez and Romelu Lukaku. I kept Zlatan Ibrahimovic and Eden Hazard while also adding Michail Antonio, Jason Puncheon and Robert Snodgrass to the midfield. In defense I kept Antonio Valencia and Jonny Evans and brought in Leighton Baines and David De Gea as my goalkeeper. The bench is a bit light, but Enner Valencia provides cover for Lukaku while James Collins and Donald Love are my low price targets that let me have the four high priced attacking players. In preparing for week 6 I have two free transfers after keeping this same team for the past two weeks. At this time I’m still undecided, but am looking at bringing in Etienne Capoue at 5.0 and possibly one other transfer as well as shipping out Hazard and/or Snodgrass. Hazard has not performed as well as I had expected and Chelsea have a tough string of fixtures going up against Arsenal (A), Hull (A), Leicester City (H), Manchester United (H), Southampton (A), and Everton (H). Perhaps he will step up and start to score, but so far I haven’t seen the improvement in his game that I had hoped for. Snodgrass also has some fairly difficult matches coming up against Liverpool (A) and Chelsea (H) before several matches that could be considered favorable against Bournemouth (A), Stoke (H), Watford (A), and Southampton (H). Meanwhile Capoue has performed very well with 4 goals in 5 matches and Watford are looking like a good team after a slow start. They have a good strong set of fixtures coming up as well against Burnley (A), Bournemouth (H), Middlesbrough (A), Swansea (A), and Hull City (H) before facing Liverpool (A) in gameweek 11. If I bring in Capoue at 5.0 and let Hazard and Snodgrass go that would leave me with 10.7 to spend. Not enough to bring in De Bruyne, but does leave me room to play with as well as leaving the option of taking a -4 hit and transferring Enner Valencia for someone else. Other matchups to look for this weekend include Crystal Palace players going up against Sunderland. This would include Christian Benteke at 7.6 and Jason Puncheon at 5.5. There are also solid picks there with Wilfried Zaha at 5.4 or Andros Townsend at 6.3. I would recommend Scott Dann as well, but he does not look likely to play this weekend. This could make Joel Ward a decent pick at 4.9. West Brom facing Stoke City is another great place to look for points in both offense and defense. Stoke City has begun the year with a -11 goal difference and they look like a team destined for relegation. While this could be the weekend they turn it around, West Brom have also looked like a team that is starting to find its way with an attacking threat in Nacer Chadli (6.4). He is listed at 75% chance to play, but might be worth taking a risk on. Arsenal v Chelsea is probably the biggest match of the weekend and I would say any and all Arsenal offensive players are up for grabs in this one. They come at a price, but if you can afford it this could be a big game for them. Chelsea’s defense has not looked good and they have already allowed 6 goals while Arsenal has scored 12. This is a good match to avoid defense on either side and even picking Chelsea offense is a good idea since the other side of this is Chelsea’s 10 goals scored and Arsenal allowing 7. As always this weekend is looking like another action packed Premier League gameweek. There should be plenty of fantasy points all around. There weren’t a whole lot of differentials in this list for week 6, but at this point, I’m looking to pick up solid points and get in above the average. It is probably a good time to take a chance on a player from West Brom or Crystal Palace or even Liverpool (facing Hull at home) and I may still do so. Good luck and have fun!